Author: Halsey Carr, Rosamond Set In . . . Description: In 1949, Rosamond Halsey Carr, a young fashion illustrator living in New York City, accompanied her dashing hunter-explorer husband to what was then the Belgian Congo. When the marriage fell apart, she decided to stay on in neighboring Rwanda, as the manager of a flower plantation. 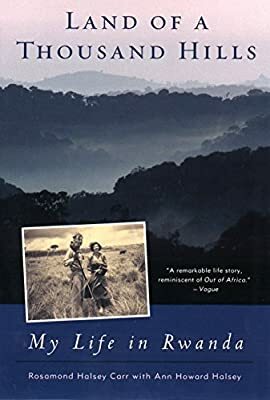 Land of a Thousand Hills is Carr's thrilling memoir of her life in Rwanda—a love affair with a country and a people that has spanned half a century. During those years, she has experienced everything from stalking leopards to rampaging elephants, drought, the mysterious murder of her friend Dian Fossey, and near-bankruptcy. She has chugged up the Congo River on a paddle-wheel steamboat, been serenaded by pygmies, and witnessed firsthand the collapse of colonialism. Following 1994's Hutu-Tutsi genocide, Carr turned her plantation into a shelter for the lost and orphaned children-work she continues to this day, at the age of eighty-seven.